I last updated you on what we’re doing to improve the MOT testing service on 7 July. Thanks for all your feedback. We do read it all and try and take it on board but I’m sorry that we don’t get to reply to it all. 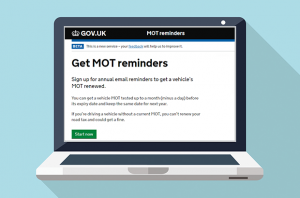 So, one of the big things we’ve been working on since the last update is our MOT reminders service, which I told you more about a couple of weeks ago. Since publishing the blog post about its development, we’ve seen the number of users jump from 5,000 to 26,500. Having more people using the reminders service and giving us feedback has proved really useful. We’ve already received some good ideas for improvements to the service, including adding MOT reminders by text and letting drivers input their vehicles details into the service before they’re due their first MOT. We’ve began working on these ideas all of which will further help to reduce the number of cars overdue for an MOT. We’ve recently updated the way garage data is presented on the MOT testing service. The changes we’ve made will make it easier for garage managers and testers to spot unusual trends in the pass/fail rate and possible testing quality issues. This information is very important. We’ve put a lot of work into making the way it’s displayed more helpful and more easy to understand. We’re going to continue updating the information we make available to you and improve how it’s displayed. We’ll make sure that we keep you updated when we make further changes. As mentioned in my blog post on 7 July, we’ve had some feedback on the service ‘time-out’ (before having to log back in) being too short – particularly when using a tablet to record the MOT result in real time. We listened to your feedback and increased the time before you get signed out to 15 minutes, so this should make the service easier for you to use. In the background we’ve continued to work on the financial side of the testing service. This supports DVSA moving to a new accounts system and will make our payments system more reliable. We’ll update you again soon about what we’ve been working on. By then, we hope that even more of you will have tried our MOT reminders service and encouraged your customers to do so. why after all computer equipment being responsibility of the station to provide why did mot slots not reduce in price? DVSA continues to invest in the MOT service and carries out enforcement checks to help people stay safe on Britain’s roads. DfT which owns the rules around fees, has been working with the MOT trade on a consultation on fees. I use my ipad and wireless printer to carry out the tests now and it is quicker for me than sitting down at a desktop at the beginning and end of each test with a paper checksheet. One thing i would like, is there to be a quicker option on the test entry screen when ive replaced a stop lamp bulb for example that wasnt working at the test. I know we have the PRS button, but i use my ipad like a checksheet during the test. So during the test i`ll select the fail option. Then if thats the only thing the car fails on and i fix it straight after so i can pass it, then i have to remove the failure item and select the item on the menu again and select the PRS option. It would be nice to be able to change the stop lamp bulb example from a failure to PRS with one quicker option. Otherwise its all good. Good job DVSA. But to make the test fee perhaps with a minimum fee would be good or fixed even better, but lets not start on that topic again!! Thats for a different department. Thank you for your feedback around the use of the PRS button during the initial test. I have passed your suggestion to the MOT development team to consider. We are always looking to improve the service and recognise that more and more testers are using tablets to carry out checks. If the bulb was put in and a straight pass recorded then this would indicate that either the vehicle met the minimum road safety requirement when presented for MOT test or that it was serviced/repaired prior to the MOT test. The PRS facility has been introduced to allow the condition of the vehicle to be accurately recorded. Mot fee's - why do you not implement every station test at the same fee for all i.e. ( different rates for different class) Sick and tired of listening to cheap mot test as low as £20 the fee for a test has not increased for several years now, however the upkeep of a mot testing station increases yearly. Also why do we still test motor homes as class 4 and class 4 fee's it takes longer to get the test done especially the larger vehicles that should be tested by Dvsa. Robert Norfolk - appreciate if you list my complaint. The Department for Transport (DfT), who own the rules around fees, has been working with the MOT trade on a consultation on fees. However work was delayed due to the recent general election. Once we have more information on the way forward we’ll keep you updated through our email alerts and this blog. The Motor Vehicles (Tests) Regulations 1981 (as amended) determines the test class of a vehicle. Essentially, any vehicle that isn’t in Classes 1, 2, 3, 5, or 7 is by default in Class 4. For this reason motorhomes, ambulances, dual purpose vehicles, etc. are in Class 4. I have had a customer not pay several years a go because I failed their vehicle they said I had not done a proper job because it failed their vehicle ,people have some funny ideas about mot tests. It's happened to us,not that often thankfully, it was more so if it was a failure. We'd expect the customer to come back for the repair & settle up after it was passed, but they'd either had it done elsewhere as it was cheaper or I'm guessing they weren't happy with the initial test, but to chase it through the small claims court wasn't worth the expense. But if your worried you may not get paid, don't forget you can ask for the fee up front before carrying out a test, if they wont pay up front then its a refusal to test : Mot manual Introduction Refusal to test 2e. "The VTS asks for the fee to be paid in advance and this is not done"
yes it would be a simple solution to the problem, we also get charged if a card payement is defaulted upon so we loose out twice. we have only had two this year but to see the vehicle on the road afterwards is to say annoying at least . Its fantastic news to learn that you listen to, and act upon, suggestions and recommendations from those ' working at the coal face '. Often, when I receive yet another questionnaire, I wonder if anyone actually pays any attention to the responses - well you have now proved that you do ! Many thanks to all the team, please continue the good work in making further improvements to what is already an excellent service. Although all the improvements are beneficial and helpful,I should like to bring a very vital point which the department must implement to help MOT approved garages.We have read continuously about garages which sell cheap MOT(reduced price) and it is understood that the ministry cannot do anything about this I feel that we should be allowed to remove an issued PAST TEST IF THE FEE IS NOT PAID,meaning to say that the person refuse to pay or leave without paying.This will help the garage not to loose money or slot. It’s an interesting point you raise about customers not paying for their MOTs after it has been done. It’s not something we have had substantial feedback on. It would be interesting to know if many other garages experience this problem. it is awkward to request payment up front . but its now easy for people to have mot test done then say I leave the mot certificate with you and go and get some money .then not coming back with money as they know its all online now so they don't need the actual certificate from you. and can easily obtain a duplicate for 10 pounds. Yes .This is a very good idea to remind the customer .